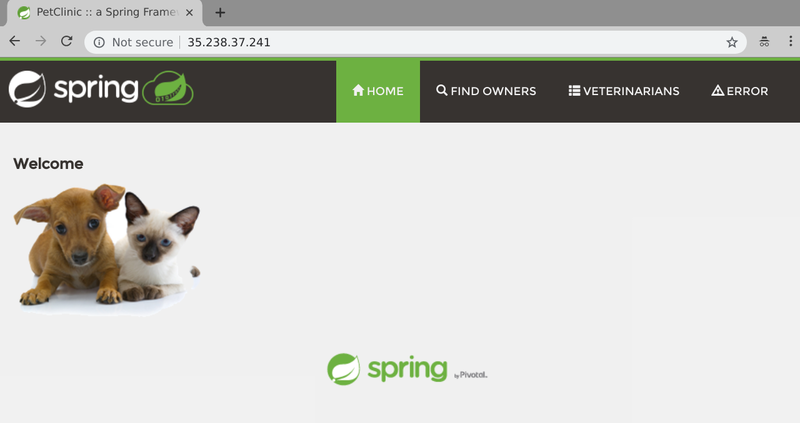 Welcome to the first part in a series of blog posts looking at running Spring applications on Kubernetes. 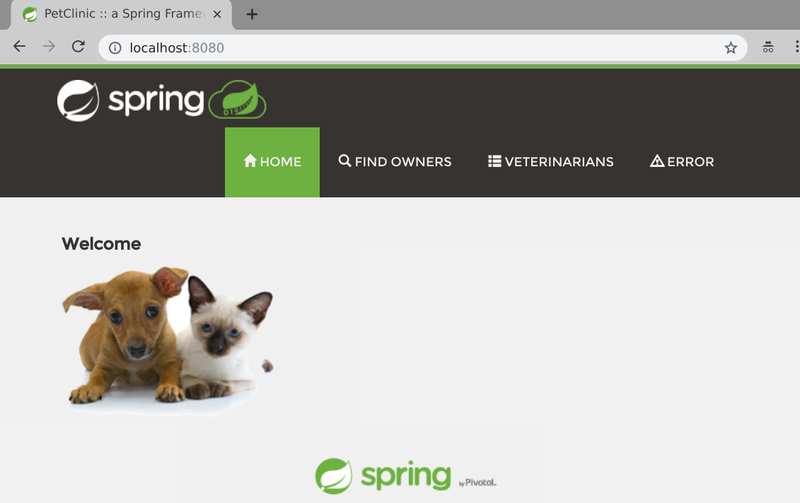 To kick the series off we’re going to take a look at the Spring Pet Clinic example application and demonstrate how we can quickly and easily get it running on Kubernetes. Before we get started I would encourage you to read (or at least skim) through Kelsey Hightower’s seminal Kubernetes The Hard Way to get an idea for the complexity of installing and operating a Kubernetes cluster. Once you’ve done that you should be thoroughly discouraged from installing Kubernetes. That’s a good thing! Most people should have no need to run their own production grade Kubernetes cluster. Every major public cloud has a Kubernetes service, and Pivotal provides the Pivotal Container Service to ease the burden of installing and managing Kubernetes in your own Datacenter. I’ll be using Pivotal Container Service. You should be able to use any flavor of Kubernetes to follow along with this series of blog posts. The simplest way to do so is to probably install and run Minikube which will give you a single node Kubernetes cluster running in a VM on your laptop. However you got your Kubernetes cluster is between you and your deity of choice and I won’t ask any questions. You should have received [or had one automatically created] a Kubernetes config file and you should have downloaded the kubectl command line tool. looking great! Create a namespace to work in that you can delete when finished to easily clean up after the demo. Note: If you are using minikube you can use the minikube docker socket and skip pushing the image up to a registry. Note: If you don’t want to build your own image you can use the one that I’ve already built paulczar/petclinic:spring-k8s-1 and skip straight to running it. remote: Enumerating objects: 7860, done. Receiving objects: 100% (7860/7860), 6.99 MiB | 14.57 MiB/s, done. Resolving deltas: 100% (2908/2908), done. Note: For more ways to build Docker images for Spring Applications see the official Spring documentation. Note: We’re running docker with the -ti flag to keep it in the foreground, --rm to delete the container when done and -p to map a port from localhost. Stop and delete your running container by hitting control c in the terminal running the docker image. There are two main ways of interacting with Kubernetes. declarative and imperative. With declarative you run kubectl apply with a local copy of the Kubernetes manifest and let Kubernetes determine how to ensure the running resources matches. When you use Kubernetes imperatively you give it more precise commands like kubectl create and kubectl run. Most advanced users of Kubernetes use the declarative methods, but the imperative are perfect for when you’re just getting started or want to do something quickly. You can see that Kubernetes has created several resources. It created a Deployment which is reconciled by a Kubernetes controller for managing the lifecycle of ReplicaSets. The Deployment created the ReplicaSet which has a controller for ensuring a set number of replicas of your application is running. The ReplicaSet created a Pod which is your running application. Note: Controllers are a major part of what makes Kubernetes so good. They create tight control loops around resources to add more complex functionality as described above. You might notice that the Kubernetes output above does not give you an IP address or any hints as to how to access your application. This is because we need to expose the application using a Service resource. Stop the port forward with a control-C on in the terminal. Note: If you are running minikube you won’t get a real loadbalancer and can run minikube service example-service --url to get an IP/Port combo that should work. Congratulations! You’ve successfully deployed a basic Spring application to Kubernetes and it wasn’t even all that hard. Using Kubernetes imperatively like this is a great way to get started and easily demonstrate running an application on Kubernetes. Of course there’s many more things to take into consideration if you want to run an application in production on Kubernetes and we’ll explore some of those things in future installments of Spring Into Kubernetes.